Marian Calvert sent us a letter recently. Thanks for the letter, Marian. 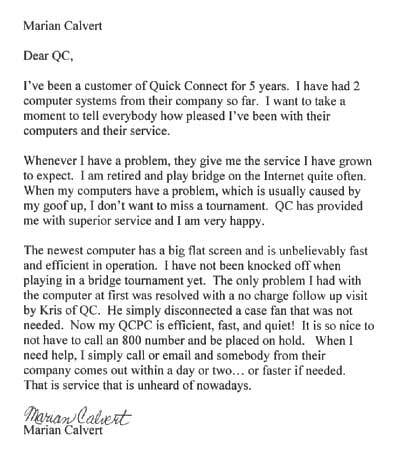 I’ve been a customer of Quick Connect for 5 years. I have had 2 computer systems from their company so far. I want to take a moment to tell everybody how pleased I’ve been with their computers and their service. Whenever I have a problem, they give me the service I have grown to expect. I am retired and play bridge on the Internet quite often. When my computers have a problem, which usually caused by my goof up, I don’t want to miss a tournament. [Quick Connect] has provided me with superior service and I am very happy. The newest computer has a big flat screen and is unbelievably fast and efficient in operation. I have not been knocked off when playing in a bridge tournament yet. 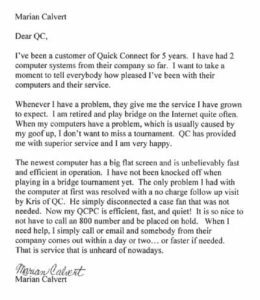 The only problem I had with the computer at first was resolved with a no charge followup visit by Kris of [Quick Connect]. He simply disconnected a case fan that was not needed. Now my QCPC is efficient, fast, and quiet! It is so nice to not have to call an 800 number and be placed on hold. When I need help, I simply call or email and somebody from their company comes out within a day or two… or faster if needed. That is service that is unheard of nowadays.